I’ve been using the Bissell Perfect Sweep Turbo for years now and decided it was time I tell you why I’m such a fan of this thing. You should know up front: this is NOT a hired post! This is just my experience with a cleaning tool that I’ve come to love and rely on every day. If you want to find out about other things I use in my home — and why I like them — check out my list of Recommended Cleaning Products. Keeping floors free of pet hair, crumbs, and all the other little messes that accumulate on them makes a big difference in how clean your home looks. That’s why I wind up using my carpet sweeper pretty much daily between deeper cleanings. I grew up in the 1970s when carpeted kitchen floors were in style, something that makes me cringe to remember. (It was a different world back then.) Using a broom didn’t make sense, so we ran the carpet sweeper after dinner each night then vacuumed the carpet thoroughly on Saturday mornings. It wasn’t until I moved into my first apartment during college that I realized how much better carpet sweepers are than brooms. It seemed like whenever I used a broom, I’d flick dirt from one place to another, then have to go over the area repeatedly. When I’d sweep the mess into the dustpan, there was always that fine line of dirt I’d need a damp paper towel to clean up. 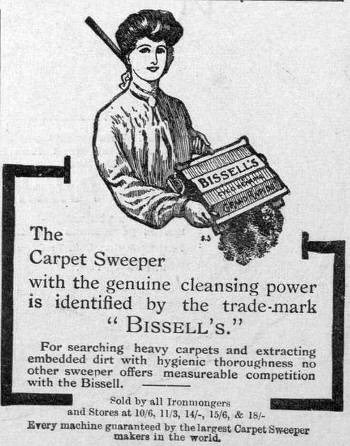 I waitressed for years in college, and one of our tasks was to “Bissell the restaurant.” I guess when it comes to carpet sweepers, the Bissell name became synonymous with the product, kind of how everyone calls facial tissues “Kleenex,” even though that’s a brand name. Well, our restaurant owner bought some other brand, and it broke every couple of months. He finally went with an authentic Bissell. That’s why I didn’t bother trying some other brand when I finally bought one. 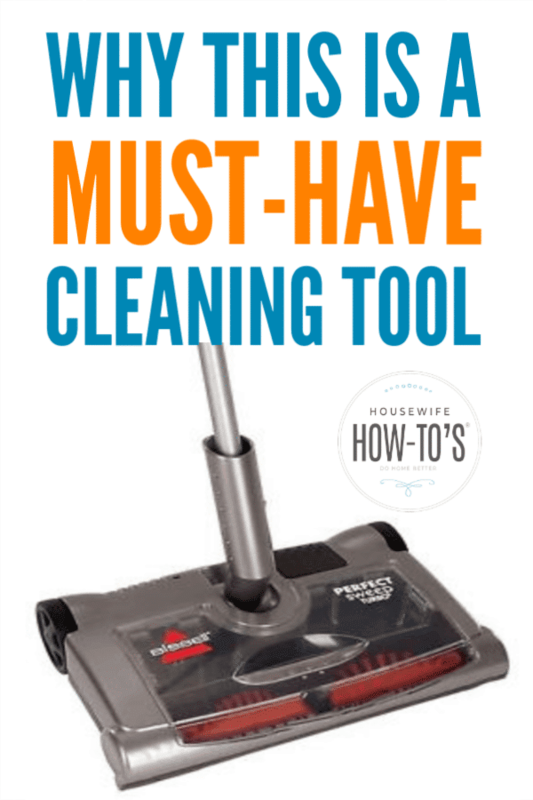 A carpet sweeper is on the must-have list of cleaning tools in my book, 30 Days to a Clean and Organized House, with good reason: it’s a fantastic, inexpensive floor cleaning tool. Carpet sweepers come in two basic styles: manual and electric. While they all work the same — you push the thing backward and forward — the manual ones require more effort. I bought the electric, cordless Bissell Perfect Sweep Turbo because it’s so convenient to use. Once fully charged, you get 60 minutes of cordless cleaning time, during which the rotating brush does most of the work. Although not a substitute for regular vacuuming, the carpet sweeper does a fantastic job of picking up crumbs, pet hair and dirt from carpets (including area rugs and entry mats) and hard floors, too. At 4 lbs. it’s sturdy without being cumbersome, and still lightweight enough to hang from a broom holder, so it doesn’t take up valuable floor space in your laundry room or wherever you store cleaning tools. Ever try to get your kids to sweep the kitchen properly with a broom? After you’ve taught them not to use wild, big motions like they see in cartoons, using a broom is still tedious enough to prompt a lot of whining, at least from my kids. Not so with a carpet sweeper: they quickly realized it took less than 3 minutes to clean the entire kitchen floor, which meant it just wasn’t worth it to them to argue about it. I am a firm believer in empowering kids to help around the house and using a carpet sweeper instead of a broom accomplishes that. The Bissell’s body doesn’t scuff baseboards. Meanwhile, the rotating brush extends to pick up dirt all the way to the edges of the floor. It’s low enough that it zooms right beneath my overhanging kitchen counters to get the pet hair that seems to accumulate there most of all. Cleaning is easy: you lift the top-loading dustbin out and dump it into the trash can, but it’s that process that leads to my one complaint. The dustbin’s design keeps debris from flying about during use, but you’ve got to shake it a bit to dispose of what it’s collected. As someone with allergies, I would much prefer a way to empty the thing without creating a small dust cloud in the trashcan. At $34.99 (on the date of publication), the Bissell Perfect Sweep Turbo carpet sweeper is more expensive than an old-fashioned broom but does a superior job. That’s why I consider it a must-have cleaning tool. 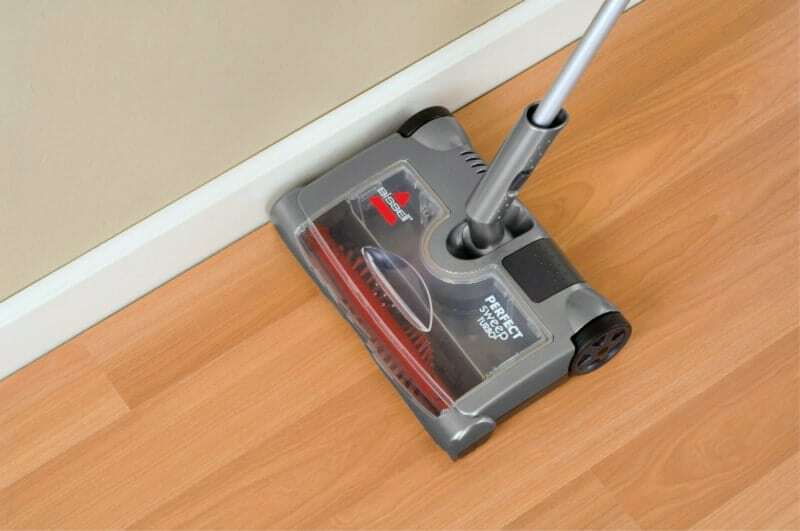 • Keeps carpets and hard floors looking good between regular vacuuming. • 60 minutes of cordless cleaning time. • Turbo brush does most of the work for you. • Easy enough for kids to use. • Cleans under furniture and up to baseboards. I saw that this post is from a good while back so I wanted to check with you to see if you’re still using the same sweeper or have you since found another one you prefer? The same question applies to the iLife vacuum you posted as a favorite. I have two large dogs inside, feel as though I spend a huge amount of time with a vacuum in my hand (daily for the most part LOL) and still can’t seem to keep it tackled. Between the hair and the dirt they bring in from outside, it’s a neverending battle so I’m looking for help! LOL Thanks for this AMAZING site! You’re a true gem! I look forward to hearing back from you soon. Thank you for the kind words, Debi! Yes, I still use both and am so happy with them. 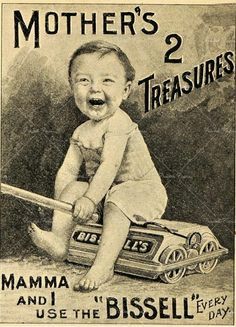 Last Spring, I had my carpets replaced with hard flooring, so I mostly use the Bissel to deal with cat litter in my laundry room. It’s a champ! Between those two things, I’d say 90% of the pet hair problem is under control around here — finally! I do still use a cordless vacuum on the furniture and carpeted stairs weekly, but that takes just a few minutes. Still, lots easier than shaving my dog and cats! How is it for hardwood floors and bathroom tile? I just recently purchased a Shark Navigator that I love for carpets but the wheels on the floor attachment are a bit too much for the hardwood floors. And since we just had them refinished I have just been using a swiffer dust mop but it’s similar to what you said about using a broom–I don’t feel like it is really getting them clean. So I pull out my old vacuum that I really want to get rid of but keep it around for the floors. I think it does a fantastic job between more thorough cleanings. I am not a fan of Swiffers for a number of reasons, and this definitely works better than they do. After going over my kitchen floor, I run it in the laundry room where the cats regularly track litter all over the floor. It cleans it up without throwing it all over the place, and afterwards it’s easy to dump and rinse the tray then wipe the unit clean. It really does. The sweeper doesn’t make my new puppy freak out the way the vacuum cleaner does, either. I love that!